I don't think I've met a poker player that’s living the dream quite as truly as a player I chatted with last night at the Punta Cana Poker Classic. Tyler, a young player from Missouri, won his way to Punta Cana in a satellite tournament at Americas Cardroom, the biggest US poker room. He more than survive Day 1 -- he’s got over 70,000 chips and thinks he's is in the Top 20 heading into Day 2! My video today has highlights of our conversation. The full version is on the Americas Cardroom poker news blog. 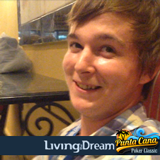 Tyler’s never played an action packed live tournament like the Punta Cana Poker Classic. In fact, he’d never even been on a plane before this epic trip! There's lots of young guys playing here this week, but Tyler's gotta be about the youngest. I'll keep my eye on Tyler through Day 2 tonight and, hopefully, will see him at the Final Table on Sunday. I'll have one more video episode with final results on Monday.